A 2/3 painted wall adds contrast to a white dresser. My Overlays make this HEMNES dresser nearly unrecognizable! Crystal and gold knobs are the perfect addition beneath a stunning gallery wall. How sweet are these delicate bow knobs contrasted with the leather pulls below. These faceted knobs keep the contrast of the original knobs but add a unique touch. Swapped out knobs and a geometric paint job take this HEMNES dresser to the next level. We will always love an ombre dresser. Crystal knobs are ultra feminine and look sweet beneath a hand letter sign. The leather pulls add a cool factor in this awesome nursery. Gold knobs always upgrade a basic dresser. Floral decals pretty up the blank space above the dresser in this nursery. The HEMNES 8-drawer dresser is a true staple. It has classic looks, lots of room and an affordable price for its size. I have one in my own home, and it’s sturdy and has held up great. It’s no surprise that it shows up over and over again in nurseries. 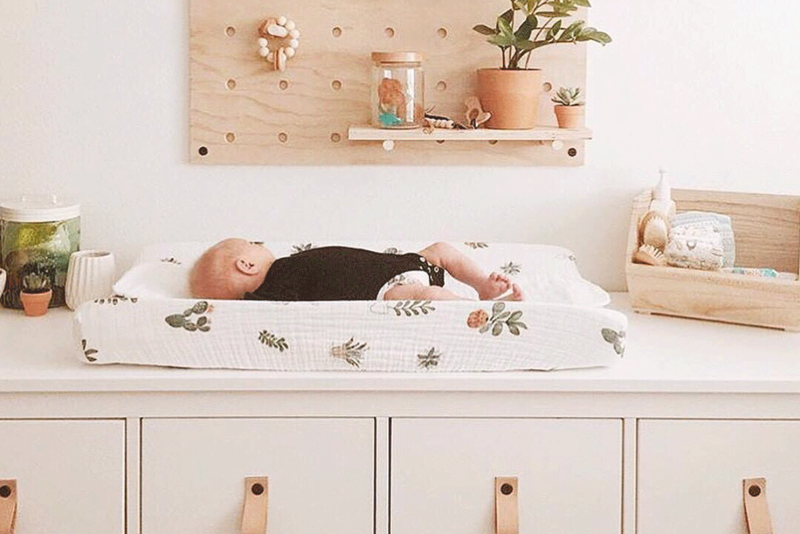 There’s plenty of space not only for baby’s clothes but for all your extra crib bedding and blankets, with room for diaper storage left over. We’re sharing twelve nurseries and kids’ spaces in our slideshow above that used the HEMNES dresser. Some used it as is, others swapped out knobs, added overlays or even painted the dresser! They all look great.